Daequan Leslie’s mother didn’t go to college. But from a young age, she made it clear to him that he would. “It was always established,” Leslie said. Though he knew higher education was on the horizon, there was no road map for how he would get there. He certainly didn’t anticipate that squash – the sport, not the vegetable – would be part of the equation. “Squash?” Leslie said, “at first I thought it was lacrosse.” Squash, not unlike racquetball, is a contest between two players on a four-walled court with a small rubber ball. While a student at Thurgood Marshall Academy, a public school in Harlem, it was through StreetSquash that Leslie’s classmates introduced him to the game. “They peer-pressured me into joining, and I liked it,” Leslie said. Now 21-years-old, Leslie is an alumnus of the program. 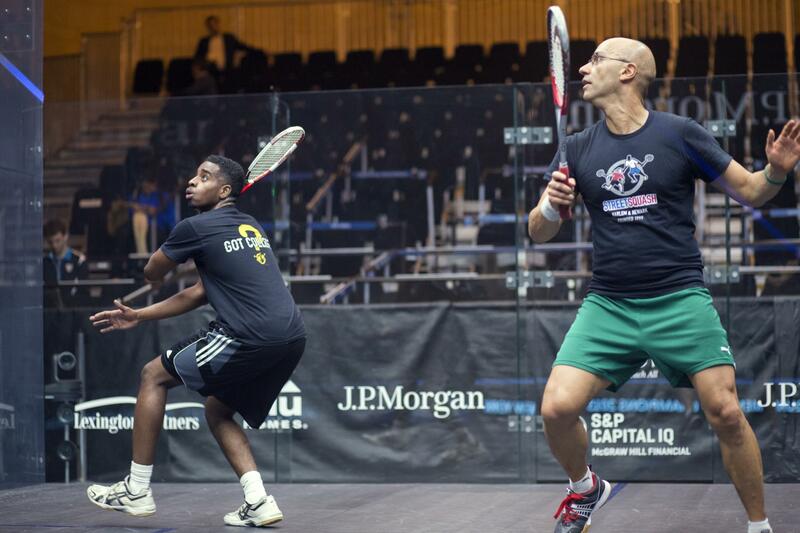 Founded in 1999, StreetSquash is one of 15 Urban Squash programs in 14 American cities. Each of these independent non-profit after-school programs provides academic tutoring and squash instruction to more than 1,500 students across the country. Another component of the programs is mentoring. StreetSquash is where Daequan was introduced to his mentor and now friend, Joe Kazemi. “It’s a great sport to enjoy at any level, really – whether you’re a beginner, an intermediate or a pro,” said Kazemi. Kazemi is a statistician at The City University of New York (CUNY), who got involved with StreetSquash not because he played the game himself, but by way of good old-fashioned advertising. Kazemi, a resident of Hamilton Heights noticed a StreetSquash poster while visiting Harlem’s African Market. “I was very intrigued because I was looking into volunteer opportunities at that time,” Kazemi said. Though historically associated with the British Empire, New England Prep Schools and the Ivy League, the sport continues to grow, and is expanding rapidly to a new demographic. Urban squash around the country has taken root at colleges where a history of the game exists. Today, kids like Leslie who have participated in urban squash programs are almost all college bound and they’re prepared for it. They compete nationally in the sport from as young as 10-years-old and these student athletes grow up to play on elite varsity college rosters, from Bates to Cornell to Franklin and Marshall to Harvard. Leslie recently stopped by the courts to coach some of his former teammates at Urban Squash Nationals, which brought hundreds of players from around the U.S. to New York City. But squash is part of these kids’ lives every day. Beyond the day-to-day routine of after school academic and on court training with volunteers and devoted urban squash staff, these programs provided opportunities for their students to get on court with world class professionals at the JP Morgan Tournament of Champions in New York’s Grand Central Terminal. The top players in the world, mostly foreigners, have been grinding out games in search of international acclaim and prize money all week. Leslie got to hit the ball around with world-ranked number 20, Nicolas Mueller of Switzerland. “I’m always excited to get on court, especially with a professional athlete,” Leslie said. It was a treat for Kazemi too. “I mean, these pros are just amazing athletes, the way they move, the way they hit the ball, they way they think and anticipate. Also the way they prepare,” Kazemi said. Perhaps the most important part of the game is that it brings people together and puts them on the same playing field — or rather, the same court. For anyone young who plays the game, it’s a great example of how hard work pays off, and allows one to achieve goals, like going to college. Next articleHow did the bald eagle become America’s national bird?